Education is at the core of the SOC’s mission, not only through publishing Camera Operator, but through educational events as well. So it was with great pleasure that we presented two exceptional educational events while participating in the annual J.L. 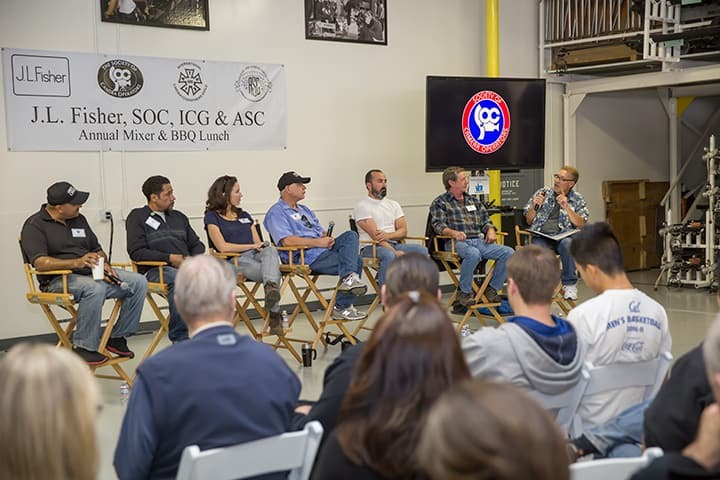 Fisher Mixer and BBQ Lunch and the Cine Gear Expo this past year. On a beautiful Saturday this past June, the SOC again co-sponsored the 8th Annual J.L. Fisher Mixer and BBQ Lunch. The event started early to give participants the chance to mingle and meet with over 35 exhibitors and equipment suppliers to learn about their latest products in a warm and friendly atmosphere. 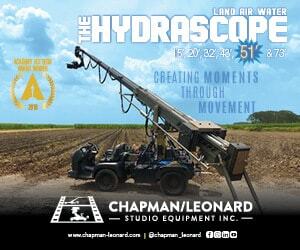 Along with the exceptional BBQ and fantastic array of products on display, tours of the J.L. Fisher facility were provided by Jimmy Fisher himself, who shared the fascinating history of the company’s origins and revealed the inner workings of several J.L. Fisher dollies with a literal inside look. Along the tour, Mr. Fisher also gave guests an in-depth look at various J.L. Fisher products including booms, bases, and jib arms while demonstrating how the company’s advanced computerized machines create the precision parts needed to build their industry-leading products. 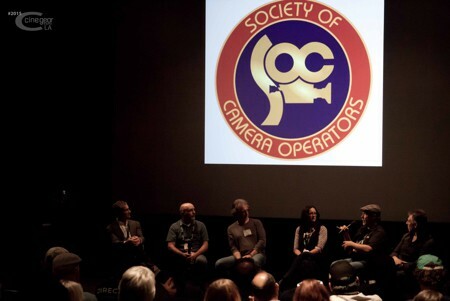 Later in the morning, the SOC, followed by ICG and the ASC, presented an enlightening panel, The Moving Camera Operation Seminar. The panel focused on the collaborative relationship between the cinematographer, camera operator, 1st AC, key grip, and dolly grip relating to camera movement and collaboration. The room was packed to capacity. The panel was moderated by SOC Member and Education Chair, Hugh Liftin, SOC and included professionals from the SOC, Local 600 and Local 80—Alicia Robbins, SOC, Twojay Dhillon, SOC, Michael Frediani, SOC, Dejon Ellis, Jr., Greg Brooks, and Eric Whitehead—all of whom engaged in a lively discussion on the topic. The hour-long panel began with the panelists revealing how they got their start in the industry before delving into the moderated discussion. Everyone agreed that the crew members using the equipment should choose the equipment. When gear is chosen by producers based on saving money, it nearly always leads to problems during the shoot, which ends up costing time and money. The value of the non-verbal, subtle communication and collaborative understanding that develops between a team who’ve worked together for years cannot be overstated. Several panelists stressed the prime focus on safety at all times. 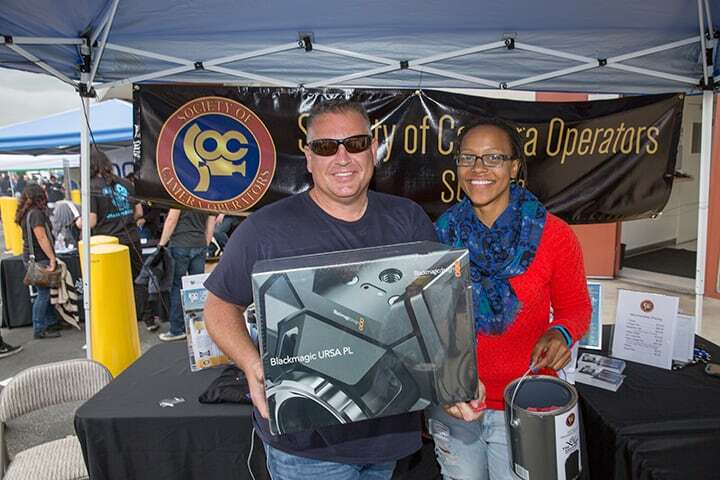 The SOC also sponsored a raffle to raise funds for our charity, the Vision Center at the Children’s Hospital of Los Angeles, reflecting our commitment to support the life-changing work done by the pediatric ophthalmologists that care for more than 15,000 patients and perform more than 1,500 ophthalmic surgeries each year. The raffle was a great success and raised over $2,500—100% of which goes straight to the Vision Center. We would like to take the opportunity to send a heartfelt thank you to those of you who bought tickets and to the generous vendors who provided the raffle prizes. At the annual Cine Gear Expo held at Paramount Studios in Hollywood, the SOC hosted a booth on the famed backlot where people could engage with the SOC and learn more about the organization, pick up free issues of Camera Operator, and test out a working Panaflex film camera generously lent by Panavision. Free T-shirts were also given out to SOC members. It was a wonderful weekend, kicked off on Friday by an engaging and informative panel presented by the SOC and held in Paramount’s absolutely packed Screening Room 5. The topic of the panel was Exploring the Key Relationship Between the Director and Operator. 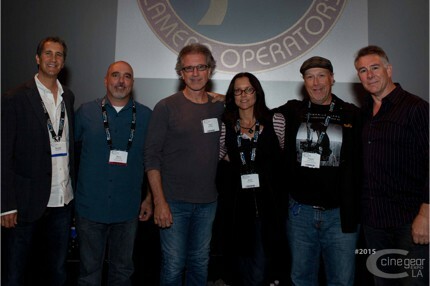 The panel consisted of operators Robert Reed Altman, SOC (Cloverfield, Bones, Chuck, Lost, The O.C., etc. ), Paul Babin, SOC (CSI: Miami, U2 3D, Magnolia, True Lies, The Abyss, etc. ), and Steven Fracol, SOC (Green Lantern, Sons of Anarchy, Scandal, Breaking In, etc. ); as well as directors Anne Renton (Bones, The Perfect Family, Love is Love, etc. ), and Randall Zisk (director/producer on Bones, Scandal, Madam Secretary, etc.). Moderating this lively discussion through his characteristic humor and wit was Producers Guild of America member and PGA New Media Council Board Delegate, John Canning (VP Interactive Experiences, NBC, Producer/Director/Photographer with Media Sherpa). The focus of the panel was the panelist’s individual perspectives on the unique relationship dynamic between the director and the operator, including why this partnership is key to a production and how to strengthen it. The hour-long discussion began with each panelist sharing a bit of their background and early experiences, with Robert Reed Altman, affectionately referred to as Bobby, sharing his experience growing up under the guidance of his father, director Robert Altman. Paul Babin described how, in moving towards his goal of becoming a director of photography, he discovered his passion for camera operating by coming up through the ranks. He claims he was “a terrible camera assistant,” but the moment he began operating, he was mesmerized by what he was seeing through the lens and loved communicating with the director about how to capture and improve what he saw. The conversation quickly moved to the relationship between the DP, director, and operator, with Randall Zisk summarizing the essence of the relationship: ultimately it’s all about elevating the production. Anne Renton expressed how her experience working as a director of low budget independent films taught her the value of a dedicated camera operator despite the fact that the budget may not allow for it. It became clear that although there are compromises on every production, people should not be considered something to be compromised. Zisk also noted how with multiple camera shoots becoming much more common, the role of the camera operator is now even more crucial. Steven Fracol felt the dynamic between the director of photography and the camera operator was key in getting the right look and feel of a television series in particular, despite new directors cycling in and out during the course of a series—each wanting to bring a unique signature to a show—the operator is often instrumental in maintaining a consistent look and feel. Altman shared a lesson he learned from Bill Rowe on the significance of the operator having their own headset in order to stay ahead of what’s going on and knows what the DP and director want even when they’re off somewhere else away from camera. He mentioned that it’s also vital on multiple camera shoots to keep all the operators on the same page. Of course it can get confusing at times, with Altman laughingly reflecting on his experience shooting Prairie Home Companion where he had a headset with the director (his father) in one ear, the monitors from two other cameras, his camera in front of him, the ComTeks from the sound department, and the DP next to him. The challenge of navigating the competing cacophony of simultaneously communicating with the key grip and the other operators, the DP telling him something while the director told him something else, and keeping an eye on the other two cameras to ensure he wasn’t repeating their shots led John Canning to take the opportunity to jokingly announce the official launch of the SOC’s fund for the treatment of schizophrenia. Altman claimed he’s already in treatment and he’s “getting better”. The conversation then opened up to a Q&A session between the audience and the panelists. The Q&A began with the topic of film versus digital as it pertains to operating, and how the operator used to be the only person who knew if a shot was in focus during the days of film, but now that role has flipped as electronic viewfinders make it more difficult to judge critical focus. The emerging importance of the DIT was mentioned as well. One of the early questions asked was regarding lessons learned from biggest mistakes, with Altman summing up the biggest lesson of all: “We all make mistakes, but when you make a mistake what you need to do is immediately tell people because it can be fixed right away, but it can’t be fixed if you don’t tell them… the next day we’re at another location. Fix it, then it’s not a mistake anymore.” Another question was how to prepare for going onto a new show as a director, with Renton stressing the importance of doing your research and getting to know the crew, while a question about how to deal with demanding directors led to some great anecdotes from several of the panelists; the consensus being that ultimately the act of actually operating a camera is only a small part of a camera operator’s job. Fracol claims that so much of the job is understanding the bigger picture and interpreting communication to determine what a director is really after—“your job is a politician, it really is”, he says. Relating to that, Altman shared how on the movie Cloverfield it took 50 takes of running down a street to get the right handheld look because after each take he received different feedback about what he should do; finally he decided to try a feeling he had—operating without looking through the eyepiece—and that was exactly what was needed. The panel ended with a question about what DP’s and directors look for in an operator they want to work with. Renton said she primarily looks to someone who is a good communicator, who is kind, passionate, listens, and wants to collaborate; in addition to their background and experience. Zisk agrees, adding how important it is for an operator to understand the scene and what it’s about (or wants to if they don’t), tries to make the scene better and is pleasant to be around for so many hours, day after day. Babin emphasized that last point as a key factor in operators who succeed, saying they have a unique ability to stay calm and focused in many situations where others might lose their cool. He concluded with a superb piece of advice for directors: “The most powerful thing you have going for you is your ability to make everyone around you feel appreciated. It’s extraordinary what you can get as a director from that.” A sentiment expressed by Anne Renton as well. The panel ended with a word on safety from Fracol, highlighting the need to not be sidetracked by what you see in the viewfinder but maintain mindfulness of one’s surroundings and anticipate what’s coming. 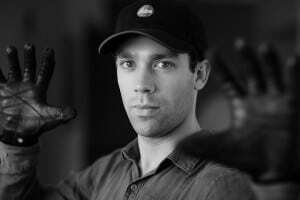 Derek Stettler is a lifelong lover and student of cinema. However, it wasn’t until shortly after graduating high school in 2010 that Derek discovered filmmaking was his life’s passion. With no camera at the time, he began learning to tell stories through video editing and writing scripts of what he wanted to shoot. At the height of the DSLR video revolution, he finally got his first camera—learning to shoot moving images with a stills camera. Derek currently lives in Houston, TX where he works as a freelance editor and camera operator, having just worked on his first feature film as key grip and 2nd AC. He recently joined the SOC as an Associate Member.